That pop of floral color in everyone’s home means the holidays are right around the corner. National Poinsettia Day on December 12 also forms a cultural bridge between the U.S. and Mexico. Poinsettias, known as Euphorbia Pulcherrima, come in hundreds of beautiful colors. Even if you have a limited holiday decorating budget, strategically placed poinsettias can enhance your home in a variety of ways. Bottom line: What’s a holiday party without a gorgeous poinsettia plant on the mantle? ​The House passed a measure recognizing National Poinsettia Day and the contributions of Paul Ecke, the founder of America's poinsettia industry. ​Spanish botanist Juan Balme referenced the poinsettia plant in his writings, calling them by their Aztec name, Cuitlaxochitl — meaning “star flower." ​Poinsettia plants were prized by Aztecs who produced a vibrant red dye. Yes, there is such a thing as Poinsettia Punch, and what's more, it's delicious and easy to make. Blend together 14 ounces of cranberry juice with 20 ounces of ginger ale. Throw in a dash of lemon juice for some citrus zing. Then, it's glasses all around and a toast to National Poinsettia Day. Bring out your hidden DIY side and use poinsettias to inspire holiday designs throughout your home. Assemble your children and friends to make unusual poinsettia-themed cutouts for your Christmas tree. Make poinsettias out of stained glass, sand dollars, or other unusual materials. You're only limited by your imagination. Visit your local botanical gardens. It's a perfectly lovely way to celebrate National Poinsettia Day. Not only will you be bowled over by the amazing varieties of your favorite holiday flower, but the peaceful environment will do wonders for your blood pressure. Let poinsettias show off for you at holiday time. ​The legendary Aztec king believed that poinsettia sap reduced fevers so he had caravans deliver the flowers to him in what is now modern Mexico City. Given that the most popular poinsettia color is red, you may be surprised to learn that among the current 100 varieties of poinsettias, Gold Rush and Christmas Beauty Marble are the latest hot new colors. 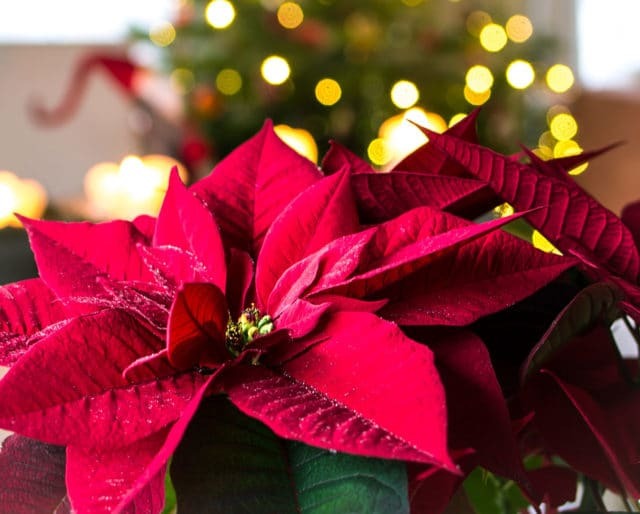 Contrary to popular opinion, poinsettias are not poisonous, but it's still a good idea to keep them away from pets because the plants might cause stomach upset and in some cases, vomiting. The poinsettia industry gushes over their plants because they are the best-selling potted plant in both the U.S. and Canada. ​Poinsettias are able to bloom after the holidays, but you have to do a ton of work during the spring and summer to get them to do it. What we refer to as National Poinsettia Day is called "La Flor de la Nochebuena" — or Flower of the Holy Night in Mexico. Poinsettias are revered there because of a legend that recounts the story of a poor little girl who despaired of having no gift for Jesus’ birthday. When an angel appears to tell the child that the most important thing is to give a gift with love, the child gathers weeds from the side of a road to place in the baby's manger. Miraculously, the weeds bloomed into gorgeous red star flowers. Joel Roberts Poinsett was the first U.S. Ambassador to Mexico. Poinsett was also an enthusiastic botanist who sent poinsettia cuttings home to Charleston, South Carolina in 1828. When the plant first arrived, early botanists considered it to be a weed. National Poinsettia Day marks the passing of Joel Roberts Poinsett and pays tribute to his love of a spectacular flower. Paul Ecke, Jr., a farmer in California, became the father of the modern-day poinsettia industry. He is celebrated for discovering a grafting technique which caused the seedlings to branch. Eventually, the flower bloomed into one of the largest and most profitable American businesses. Today, poinsettias contribute about $250 million annually to the U.S. economy.